This report is from the U S Department of Labor Bureau of Labor Statistics. 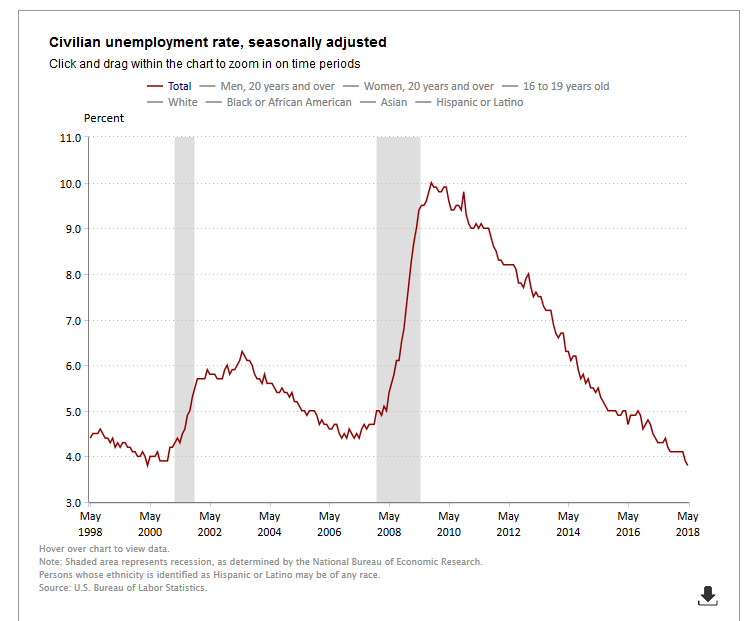 Nonfarm payroll employment rose by 223,000 in May, and the unemployment rate edged down to 3.8 percent. Over the month, employment continued to trend up in several industries, including retail trade, health care, and construction. 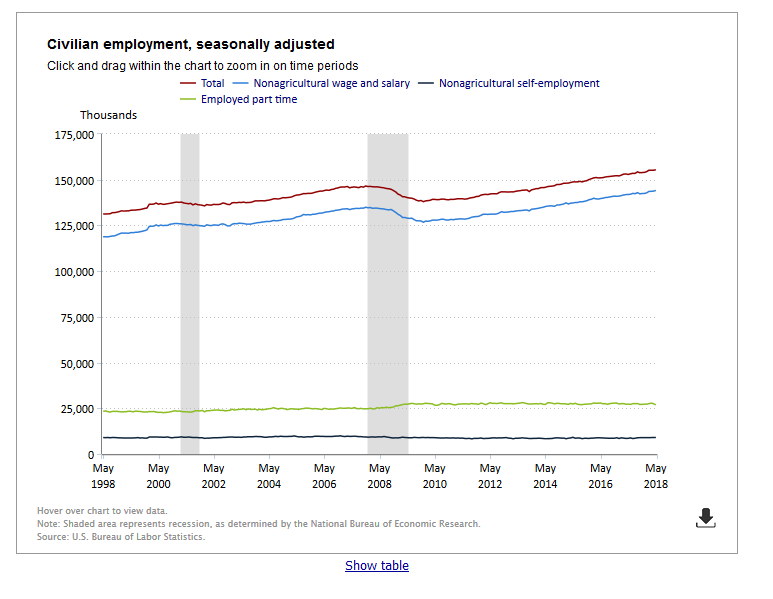 Incorporating revisions for March and April, which increased nonfarm payroll employment by 15,000 on net, monthly job gains have averaged 179,000 over the past 3 months. This is detailed in Charts 1 and 2 below. In May, retail trade employment increased by 31,000, with job gains in general merchandise stores (+13,000) and in building material and garden supply stores (+6,000). Retail trade has added 125,000 jobs over the year. Health care employment rose by 29,000 over the month and is up by 318,000 over the year. In May, ambulatory health care services added 18,000 jobs, and employment in hospitals continued to trend up (+6,000). Construction employment continued to trend up in May (+25,000). Nonresidential specialty trade contractors accounted for most of the job growth over the month with a gain of 15,000. Over the past year, construction employment has expanded by 286,000, with nonresidential specialty trade contractors representing 41 percent of the growth. Employment in professional and technical services continued its upward trend in May (+23,000). This industry has added 206,000 jobs over the past 12 months. Employment in transportation and warehousing expanded by 19,000 in May. Within the industry, job gains occurred in warehousing and storage (+7,000) and in couriers and messengers (+5,000). Over the past 12 months, transportation and warehousing has added 156,000 jobs. Manufacturing employment trended up in May (+18,000). Job growth continued to be concentrated in the durable goods component, including a gain of 6,000 in machinery. Over the past 12 months, manufacturing has added 259,000 jobs, with about three-fourths of this growth occurring in durable goods industries. Mining employment increased by 6,000 over the month. Since a recent low point in October 2016, employment in mining has grown by 91,000. Employment in other major industries–wholesale trade, information, financial activities, leisure and hospitality, and government–showed little change in May. 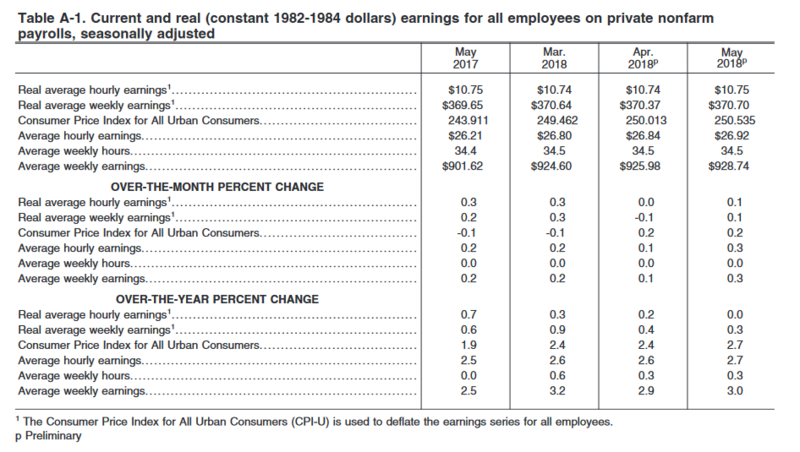 Real average hourly earnings for all employees increased 0.1 percent from April to May , seasonally adjusted, the U.S. Bureau of Labor Statistics reported today. This result stems from a 0.3-percent increase in average hourly earnings being offset by a 0.2-percent increase in the Consumer Price Index for All Urban Consumers (CPI-U). Real average weekly earnings increased 0.1 percent over the month due to the increase in real average hourly earnings combined with the unchanged average workweek. This is detailed in Chart 3 below.